Others may have different opinions but this is the way I saw things. I genuinely liked everyone on the trip and had many long and interesting discussions with most people. Anything I say about anyone or anything is purely in fun. Some information I got from others on the trip. I may have enhanced some of the information I gathered. Anything that is blatantly incorrect please let me know. All photos referenced have been converted to a smaller size for faster downloading. 26 Australians, 18 Women and 8 Men. Peter & Angie were the driver and tour guide respectively. See this photo. They did a fantastic job. Thank you. 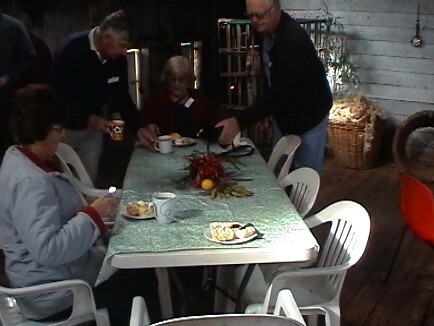 See this group photo which was taken inside the Marree Hotel. Paul is not in the photo. Ann took 365 photographs and I took 45 Mins of video. That we got back to Lyndhurst on schedule. Further down the road Emu Creek had flooded the road. See this photo. Cars could not pass. The bus got through OK.
Outback Spirit promote this tour as "The Lake Eyre Miracle". Now we know where they got the title from. It is a miracle if you get back on schedule. Found out later that the Lyndhurst - Marree road was closed for a while and then only 4WD access. The Birdsville and Strzelechi tracks were both closed for a while. Peter, our driver, also indicated that the next Outback Spirit trip to Lake Eyre which left three days after us may not get through to Marree. However, I telephoned Outback Spirit and it appears they got through OK. I suspect the proprietor of the Marree Hotel. The Chimney has been painted in the team colours. See this photo. I would have selected the Stamford Plaza in Adelaide if they had not stuffed up the menu. Those that ordered chicken for their main had to wait about 30 mins. This is unacceptable. Wilpena Resort had a very good dinner. You meet interesting people on these trips and hear some great tales, some funny, some sad. The best tale came from Glenda who related the saga of breaking her leg on a previous Outback Spirit trip. It happened on a Kimberley tour and in Tunnel Creek. It was not funny then but even Glenda laughed at times as she related the story. The ironic thing is that shortly after finishing this trip they were flying to Broome to complete the rest of the previous tour that she broke her leg on. See this photo. The sign was still there nearly a week and a half after the event. 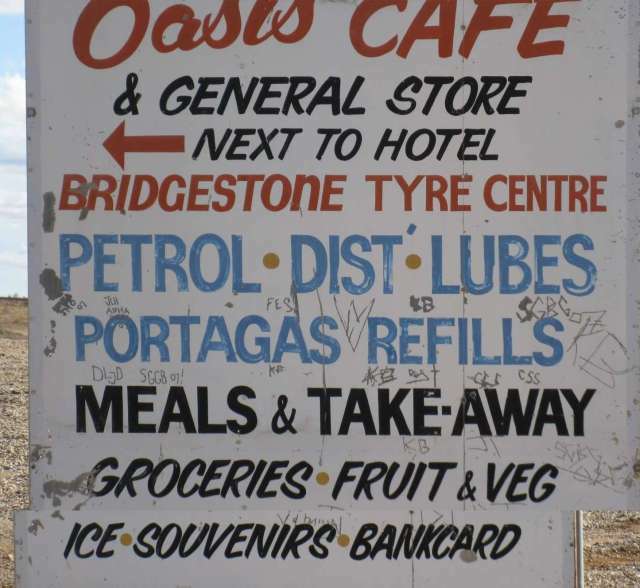 On the roads into Marree there is this sign advertising the Oasis Cafe (which I presume is the General Store). Notice "Bankcard" at the bottom of the sign which has been dead for years. These are always beautiful in the outback. We were lucky to view sunrise on the plane flying to Cowarie Station. Ann got this photo. Terry supplied this photo. We viewed sunset on the way back from our trip to Level Post Bay on the Madigan Gulf where we walked on Lake Eyre North. See this photo and this photo of Ann on Lake Eyre North. On the way there and back we passed through the dog fence. Ann got this photo of the sunset. Deirdre supplied this photo. Pichi Richi just before Quorn. Not really a "pass" as I would have expected but more of a meandering through the mountain. Only 400m max. height. The plane trips and tour of Marree. It was the highlight of the trip that everyone participated in split into two groups. The day before everyone was asked their weight and the two groups were selected to balance the weight on the plane we were to fly on. 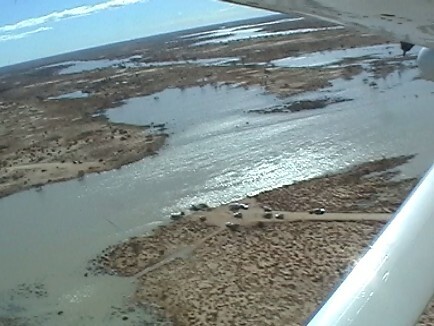 A Cessna 13 seat plane flew for nearly 1.5 hours from Marree over Lake Eyre South and North then followed the Warburton Creek and landed at Cowarie Station. We were met by the Station owner (Sharon) and the manager (Mark) of the adjacent Australian Wildlife Conservancy property of Kalamurina. We then travelled by a small bus to the Australian Wildlife Conservancy property. Along the way Sharon and Mark gave us a talk about the properties. I was hanging on their every word. It was fascinating. At the property, the Mark walked us to the Warburton Creek whilst explaining about the flora and fauna. Back on the plane we flew to where the Cooper Creek crosses the Birdsville Track and circled over the road crossing with vehicles lined up waiting to cross the creek. The Birdsville Track had been relocated to a place where the Cooper Creek was at its narrowest. Then followed the Cooper Creek to where it entered Lake Eyre North and then back to Marree for lunch. The plane then took the second group on the same trip. We then had a tour of the highlights of Marree. This should take about ten minutes I thought to myself. Turned out it was quite interesting. We toured the streets, visited the Arabunna Aboriginal centre (with a talk by Reg Dodd), viewed a film called "Salt" in the community centre, viewed the Marree racetrack, walked around the cemetery, visited Hergott Springs and the Lake Eyre Yacht Club. The cemetery is unique as it is divided into three sections - European, Aboriginal and Afghan. Some of the Aboriginal graves were adorned in flowers and football paraphernalia. See this photo. I heard someone say after the plane trip over the lakes. Well, I think most of us knew that they were not full but it did not matter. Being able to view the ecosystem from the air was fascinating. There were some stunning visual effects caused by the partly full Lakes and the sun streaming through the clouds onto the water. The aerial view of the Warburton Groove was spectacular as was the flooded Cooper Creek with its numerous lakes. Ann noticed this bin with no wheels outside the general store in Marree. Don't know how they intend to wheel it away. That grazing cattle around Marree is profitable and it is very easy to obtain ECO rating for the beef which is sold in overseas markets. This was told to us by Sharon, the owner of Cowarie Station. The grasses that grow in the area are very nutritious and there is no need to supplement their feed. ECO rating is easy to obtain because the area is free of local and outside contamination. I asked Tony (he is a farmer) what he thought about this and even he was surprised. In Marree the first night in these units at the rear of the Hotel. There were not enough blankets on the bed. Irene told us that she got very little sleep that night and ended up taking the doona off the single bed as an extra blanket. The flight that we did not have over Wilpena Pound. Fifteen of us paid our money electronically the evening before. The next day it is was deemed that the cloud cover was too low so the flights were cancelled. Then we had to get our money back. What a drama. The bank would only allow a certain amount to be refunded and our flight fees were over that limit so the transfers were rejected. It was eventually sorted. At the historic Prairie Hotel at Parachilna on the way from Marree to Wilpena Pound. The signs on the road indicate what is coming. Pictures of a kangaroo, emu and camel on a sign reading "On your plate 3 km". The next sign says "Feral Grazing Ahead". It was salads with a plate of feral antipasto - smoked roo, camel mettwurst, emu pate, goat cheese, chargrilled vegetables and bush tomato chutney served with warm Turkish bread. See this photo. Dessert was a choice of ice cream. The whole lunch was delicious. Someone should tell that to the Marree Hotel. The two lunches and two dinners we had there offered identical items each time. In fact, the side dishes were the same for all four meals. To be fair, Marree is in the middle of nowhere and the meals were OK considering the circumstances. Nevertheless, the prospect of eating more Hotel meals were a good target for joking when there was the possibility that we may be stuck in Marree for a few days after the heavy rain just before we were to leave. They do need more toasters at breakfast time. The Standpipe Motor Inn in Port Augusta on the first evening. In Marree for two evenings in these units at the rear of the Marree Hotel. The Wilpena Pound Resort for one evening. Took this photo mainly for the lovely tree outside the resort. Last evening in the Stamford Plaza Hotel on North Terrace in Adelaide. Outback Spirit staff sit with you at meal times and join in the discussions. We have taken a few overseas bus trips and it is the policy that the driver/guide deliberately do not sit with you. Not the Melbourne Cricket Ground but the Marree Cricket Ground. The sign displayed MCG. Should have got a photo of it. I heard someone say after the plane trip over the lakes. I saw lots of birds along the Warburton Creek but not as many along the Cooper Creek. Ten minutes. The last morning in Marree when we had to leave quickly because of the rain flooding the road. This sign at the town of Terowie. These structures in a field near Burra. The town of Quorn not far from Port Augusta. The name comes from the the Parish of Quorndon in Leicestershire, England. We should be allowed to use this word in scrabble. Lots of outback films have been made here. See this photo. When we arrived early Sunday morning the place was deserted. The pichi richi railway runs from Port Augusta to Quorn and there is a lovely station at Quorn. It is the oldest remaining section of the famous narrow-gauge old Ghan railway. Regular heritage train journeys run on the line. We passed an empty vehicle on the way into Madigan Gulf to walk on Lake Eyre. As is the custom Peter slowed down to see if there was a problem and there was. There were no trees close to the road for the guy to pee on. He was away in the distance. At Hawker, just near Wilpena Pound, is the Wilpena Panorama, a 360 degree painting of some of the most beautiful country in South Australia as seen from St Mary's Peak, the highest point of Wilpena Pound. The painting is high up on the wall of a circular building. There is a staircase that you climb up and a landing at the top representing St Mary's Peak that you view the painting from. It was well worth the visit. See this photo of a section of the Panorama. For the day in Marree, the original itenerary was to split up into two groups. In the morning one group would fly to Cowarie Station via the Lakes, Warburton and Cooper Creeks. The other group would drive there via the Birdsville Track, both groups meeting for lunch. Groups would then swap over and return to Marree either by road or plane. However, about two weeks before our trip commenced, the Cooper Creek crossed the Birdsville Track and a punt was put into service to ferry vehicles across the Cooper. Unfortunately, the punt has load limit less than the bus weight so the bus was unable to travel the Birdsville Track. The department has become aware of illegal activity at the ferry crossing. I believe the oldest person on the bus was Irene. She told me she was 83. An inspiration was Irene. Walked everywhere taking heaps of photos. Port Pirie Roadhouse. See this photo. Said Peter about the water he carried on the bus for us to drink. He sources it from Wilpena Pound. Someone forgot to tell this yacht Ann captured on Lake Killamperpunna where the Lake Eyre Yacht Club held a regatta from 5th to 9th July. Outback Spirit sponsored this event. At Beltana Station near Leigh Creek. A delicious Devonshire tea. The Station owner took us on an interesting tour of the Station. Of particular interest was her pet alpaca cria (baby about 5 months old) called Chocolate that followed her everywhere. The antics of her dog Rufus and male pig Romeo also amused us. Just before we left we were all presented with one of these ear clips. Don't know what to do with it. It is not the latest fashion in ear rings. Marree's electricity is generated by diesel generator. Other places were a bit more advanced. Wilpena Pound has an advanced solar system, Parachilna also has solar with diesel backup. Cowarie Station has solar but is looking at supplementing this with wind. Leigh Creek is interesting. It supplies coal for a huge power station at Port Augusta. The coal is delivered daily by the longest train in the Southern Hemisphere where the electricity is generated and then fed back to Leigh Creek to supply electricity for the town. Noticed these sleepers used as a roof over a caravan out back of the Marree Hotel. A pie/sausage roll at Orroroo on the last day. We had to pre-order what we wanted the day before and it was waiting for us in the local cafe. Orroroo is a dynamic town. Real Estate is very cheap here. A shop sign invites you to move here and compares the prices in various localities. Orroroo Real Estate is about a third the price of Port Augusta. This is our 4th trip with them and we noticed some changes. The seat rotation system has changed. Previously, to rotate you would sit in the seat directly behind the seat you sat in the day before. Now, each pair of seats is randomly numbered and to rotate you sit in the next numbered seat. Because this was a short trip we never bothered with seat rotation and just sat anywhere. They now have paper cups for drinks emblazoned with the Outback Spirit logo. Previously, you were issued with a plastic cup at the start of the trip which you used and gave back at the end. A problem with this is that the paper cups are thrown away and not recycled. A better idea would be to produce a "Outback Spirit" plastic cup that is issued in their kit and you get to keep. The clock display on the bus shows time/time engine running. Previously, this was time/date. This may be configurable. You now get issued with a kit of things. A backpack, hat, drink bottle, sunscreen and binoculars, the first three with Outback Spirit emblazoned on them. Most people chose to use the backpack which made it difficult to determine which was yours in the parcel rack. The small town of Two Wells for afternoon tea on the first day. Not a particularly exciting place. Ruins of the Kanyaka homestead. We subsequently purchased a small booklet about the homestead which was very interesting. The Old Homestead at Wilpena Pound. The pound shuttle bus took us to the start of the track and we walked a few kilometres to the house. We drove through Wilpena Pound, stopping numerous times for scenic viewing and interesting places. A viewing area over the Leigh Creek coal fields. There was also some disused machinery we looked through. The historic mining town of Burra on the last day. It was wet, cold and windy there so we did not stay long. Just long enough to visit the historic photo display in the town hall and an art show in an adjacent building. It was better than I expected. 3.5 out of 5 Stars. I was impressed with Outback Spirit because they sponsored the Regatta and give donations to the Australian Wildlife Conservancy for the guided tours. The manager of the property (Mark) told me that this years donations will nearly pay his wages for the year. They also organised and paid for our shuttle bus transfers to Adelaide airport which has not been done in the past. To everyone on the trip. You all contributed to making it a memorable event. You may be interested in this prayer.